Puffer fish have undergone a population explosion in the Arabian Sea in recent years, according to an article recently published by K.S. Mohamed and colleagues in the lastest issue of Current Science. 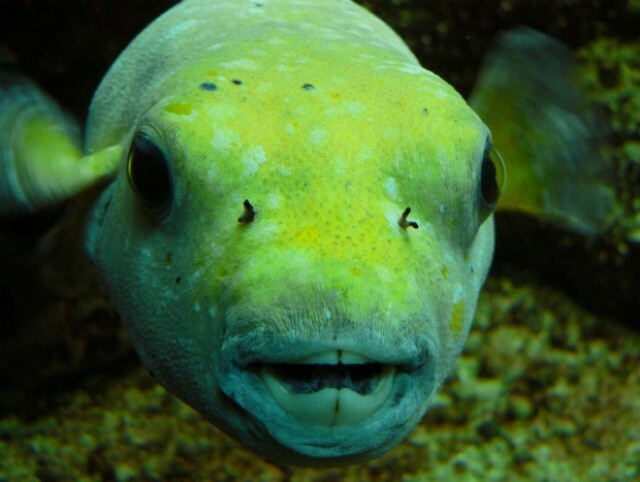 Puffer fishes belong to the fish family Tetradontidae members of which are characterized by sharp, plate-like teeth (see below) and a spiny loose skin that allows them to swell up into a spiny ball after pumping water into their stomachs (see second photograph below). 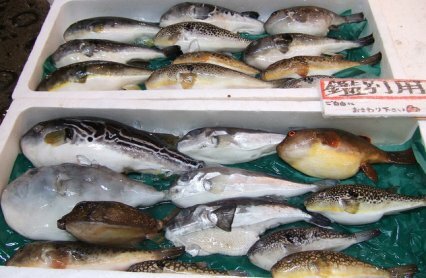 Puffer fishes also are famous for serving as the source of the Japanese delicacy fugu, which is deadly if not properly prepared. Kerala fisherman have been complaining for years about increases in puffer fish abundance. So Mohamed and colleagues analyzed fish landings at Kerala. Please friends, allow Beel to present a portion of their results. 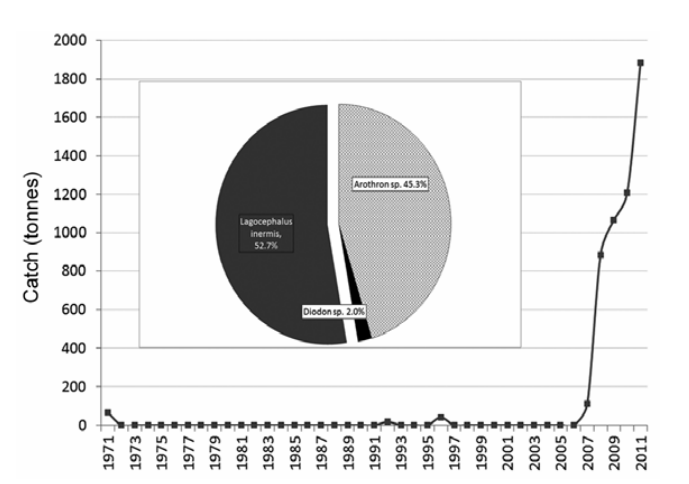 Trends in landings of puffer fishes at Kerala, India: solid line. Inset shows the composition of the catch- dark gray (to left): Lagocephalus inermis; light gray: Arothon sp. ; and black Diodon sp. (graphic source) Click on graphic to embiggen. It is obvious that there has been a huge increase, since 2007, in puffer fish landings. 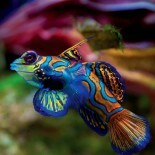 Prior to this, puffer fish were uncommon in the catch. 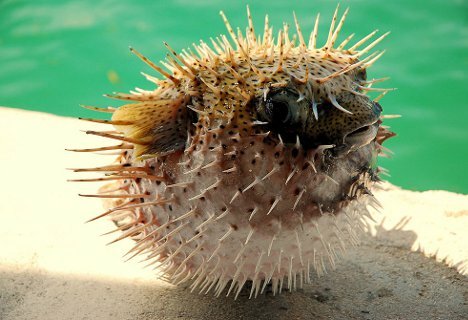 The fishermen are none to happy about this because puffer fish, when captured in nets, use their large teeth to bite at anything in reach. They damage the fishermen’s nets and other potentially saleable items such as squid and cuttlefish. Mohamed and colleagues suggest the increase in puffer fish abundance is the result of reduced predation. Three of their main predators, various sharks, marine catfishes of the genus Arius, and especially cobia Rachycentron canadum have been overfished. The fishermen have begun to derive some value from their new catch, by selling dried, salted puffer fish for export. K. S. Mohamed and colleagues. 2013. Puffer fish menace in Kerala: a case of decline in predatory control in the southeastern Arabian Sea. Current Science, Volume 104, pages 426-429. This entry was posted on March 11, 2013 by denstormer in Fishing and angling and tagged Asia, fishery management, marine fish, overexploitation.